Paros is one of the largest islands of the Cyclades and figures among the best summer destinations in Greece. The island lies within approx. 2,5 hours (with a high-speed boat) or 4 hours (normal ferry) distance from Piraeus with frequent connections to almost all other islands. Paros is probably the only island in Cyclades having accessibility to all known and unknown beaches, with sand, pebbles and clear waters (flat island). There are also many fishing villages offered for family vacation. In the various events taking place in the villages and festivals, visitors can enjoy plenty of Parian wine or suma and taste local delicacies served by local people. There are lots of great sandy beaches in Paros island. Monastiri: Organized beach with shallow water for several meters . The bay of Ag.Gianni ( Monastery ) is sheltered from north winds. Kolimbithres: Remarkable beauty with white stones on the beach and in the sea. Golden beach:Beach with white sand suitable for water sports because of the winds . Faragas: Three small creeks to choose. You will enjoy sunbath and swimming. Santa Maria: Organized beach with a variety of water sports and music from the beach bar. Suitable for children . Kalogeros: Beach Suitable for covering your body with clay. Diving centers, Water Sports, Kite surf, tennis, horse riding , day trips by boat, cycling, travel across Paros and Antiparos by bus with a guide. You will never be bored.. The “Holy Trinity” in Lefkes village, a small traditional village in the mainland. The Church is made of Parian marble. Nightlife in Paros‘s Naoussa and Parikia. Many bars and nightclubs with live music all night. You can also find a variety of restaurants that serve fishfood in the port. Still another option for nightlife more quiescent is in Marpissa, in Logaras , Aliki and Drios. 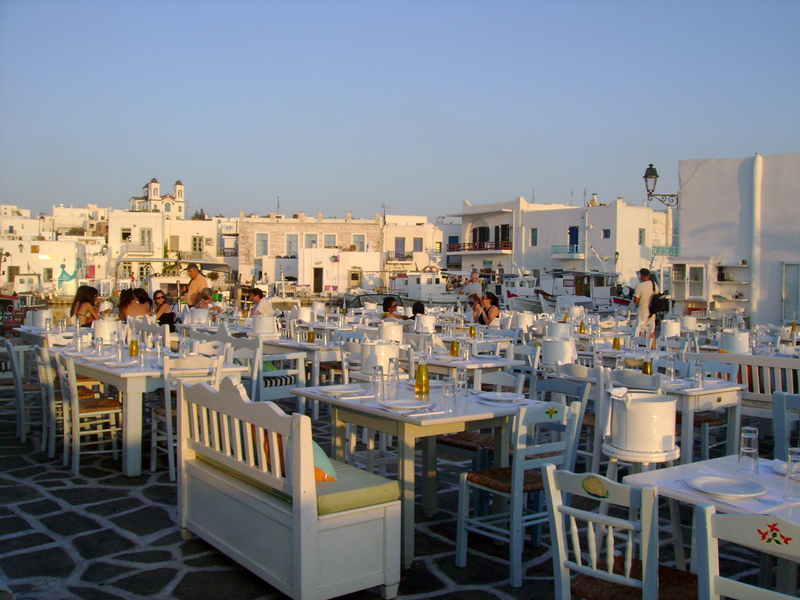 In Paros are many festivals in various villages, with traditional food and dances. Fair where people burn the wreaths of 1st May. Takes place to Aliki , Naoussa and Prodromos village . People light large fire to burn the wreaths and flyby . The inhabitants of Naoussa serve fresh fried fish , plenty of wine and suma. All night dance with traditional greek music at the port of Naoussa . Parade, Procession image Chairetismos ship , Pyrotechnimata and traditional area of the beach park. Representation of the raid of Barbarossa and the Pirates and the battle fought by Naoussa to get back their women . Dancing and singing at the port of Naoussa . Feast of St. John’sa at monastery . The feast takes place on the beach .